Erin Andrews told “The Insider” she was “shocked” and “disappointed” after hearing “The View” co-host Elisabeth Hasselbeck’s commentary on her “Dancing with the Stars” outfits. Hasselbeck said on her show Tuesday that “coming off what just happened with [Andrews]” and her stalker going to jail, she didn’t think she should be wearing “next to nothing” on “DWTS.” “In some ways, if I’m him, I just could’ve waited 12 weeks and seen this (points to photos of Andrews on ‘DWTS’), a little bit less, without the prison time,” she told “The View” panel, referring to Andrews’ stalker who videotaped the ESPN correspondent in her hotel room without her knowledge. “Dancing With The Stars” finalists Joey Fatone and Melissa Rycroft are teaming together for a special charity for kids around the world. Shannen Doherty voted off of Dancing With the Stars. Shannen and Mark tweeted about strawberry pancakes before Good Morning American appearance. 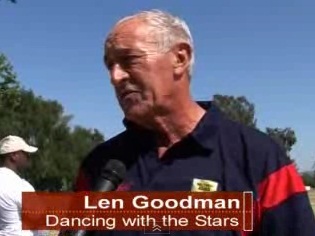 Speaking at the celebrity cricket event, Dancing with the Stars Judge Len Goodman challenges Simon Cowell to swap judging panels for a night. “Dancing with the Stars” co-host Samantha Harris talks about the show and her other projects.